War Guilt Clause: Britain and Biafra – Royal Times of Nigeria. 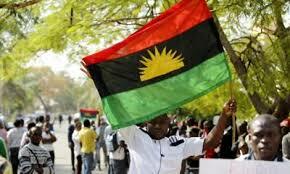 Ralph Uwazuruike, the founder of the Biafra Independence Movement, declared May twenty-second Biafra Day. Demonstrations were quickly met with repression, however, as police cracked down on a parade in Enugu for disturbing public peace. This chain of events very aptly characterises the relationship between the Biafran independence movement and the Nigerian central government. Each party continues to accuse the other of violence. But my people, these blaming fingers are being pointed in the wrong direction. The current situation dividing the South of the country from the rest was created not by Nigerians themselves, but by the British political system that preceded Nigeria’s creation. The British Protectorate of Nigeria was characterised by division and competition which balkanised Nigerian politics. The 1946 and 1951 constitutions divided Nigeria into regional houses of assembly, none of which had significant legislative power. This set up a hostile atmosphere of identity politics fuelled by tribal rivalry and bias. In the following years, Nigeria descended further and further into discord due to the perpetuation of these political divisions. And now today, we are left to pick up the pieces of the maladaptive and poorly constructed governmental policies of our colonial past. It is these same cracks in the system that create deadlock in solving other regional conflicts in Nigeria including the Middle Belt crisis and the degradation of the Niger-Delta. And yet, we Nigerians only seem to blame ourselves for our persisting ethnic divisions. After the First World War, the victors drafted a clause, article 231, stating that Germany was at fault for the war. However, no such clause has been drafted to assert the role of the British in causing the Biafran War. Shall we then surmise that, this is our War Guilt Clause. The Federal Republic of Nigeria affirms and the United Kingdom accepts the responsibility of the United Kingdom for causing all the loss and damage to which the Federal Republic and her nationals have been subjected to as consequence of the war imposed upon them by the ineptitude of the United Kingdom and her policies. May God Bless the people of our beloved country, Nigeria. Funmilayo Adetokunbo, a Political and International Affairs analyst writes from Somerset, England, United Kingdom.